Coccidioides immitis is a fungus endemic to the Southwestern United States, Mexico, and parts of Central and South America. While some populations are more at risk for the infection, most persons infected with the fungus remain asymptomatic. However, up to one percent of these individuals will go on to develop the disseminated form of the disease. Manifestations of this secondary type of infection may involve both soft tissue and bone. We present a case report of a patient presenting with a painful ankle who was found to have diffuse coccidioidal osteomyelitis. After a confirmatory biopsy and culture, long term fluconazole therapy was initiated as the recommended treatment. Although the disseminated form of the disease is relatively uncommon, it is important to include the infection as a differential diagnosis in patients living in endemic areas who present with suspicious bone lesions. Disseminated infections may affect the skin, soft tissue structures, bone, joints, and meninges. Skin lesions include papules, abscesses, or pustules. Synovial lining and joint infections may lead to arthralgia and peri-articular edema, with coccidioidal osteomyelitis occurring in up to fifty percent of patients with disseminated disease. [7,8,9] Coccidioidal meningitis is the most lethal form of disseminated disease with these infected individuals presenting with nausea, vomiting, headaches, and altered mental status. We herein report on a patient with previous primary coccidioidal infection that subsequently progressed to disseminated disease involving the foot and ankle. 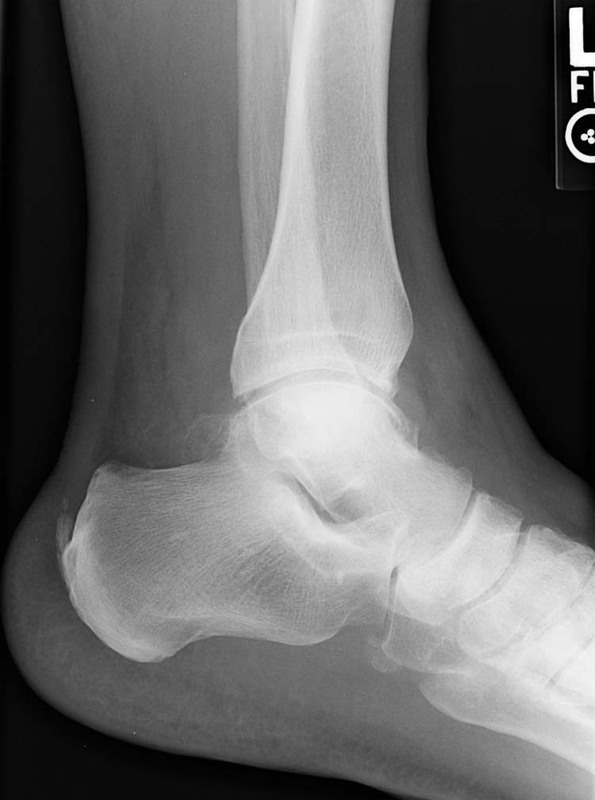 Figure 1 Initial radiographs revealed mild degenerative changes within the left ankle joint, but no other pathology. Pertinent past medical history included osteoarthritis, gout, coccidioidal pulmonary infection, hypertension, diabetes mellitus, and renal insufficiency. Ankle joint aspiration was attempted, but did not yield any fluid. The patient was given an intra-articular injection of corticosteroid mixed with a local anesthetic. The patient was seen one week later stating that the injection aggravated his ankle. He was placed in a walking boot and scheduled for a left ankle arthroscopy. Intra-operatively, capsular adhesions with extensive synovitis were noted. In addition, anterior talar dome abnormalities including discoloration and soft cartilage were evident. The remainder of the ankle joint cartilage appeared normal. Post operatively, the patient reported improvement in pain and worked with physical therapy weekly to improve ankle range of motion and strength. Figure 2 Radiograph of affected foot showing talar neck fracture and diffuse osteopenia subsequently confirmed to be coccidioidomycosis infection. Laboratory testing revealed a normal white cell count with mild elevation of glucose, creatinine, and phosphate. Uric acid was elevated to 9.0, C- reactive protein was 2.7, and the erythrocyte sedimentation rate was high at 65 mm. The coccidioides screen was positive and the antibody titer was elevated. Differential diagnoses at this time included; septic arthritis, coccidioides osteomyelitis, gout, osteomyelitis, neoplasm, Charcot arthropathy, and trauma. anaerobic, and fungal growth. The pathology report identified extensive necrosis of bone and soft tissue with coccidioidal granuloma present within both the talus and the surrounding synovium. (Fig. 3) No other organisms were identified. 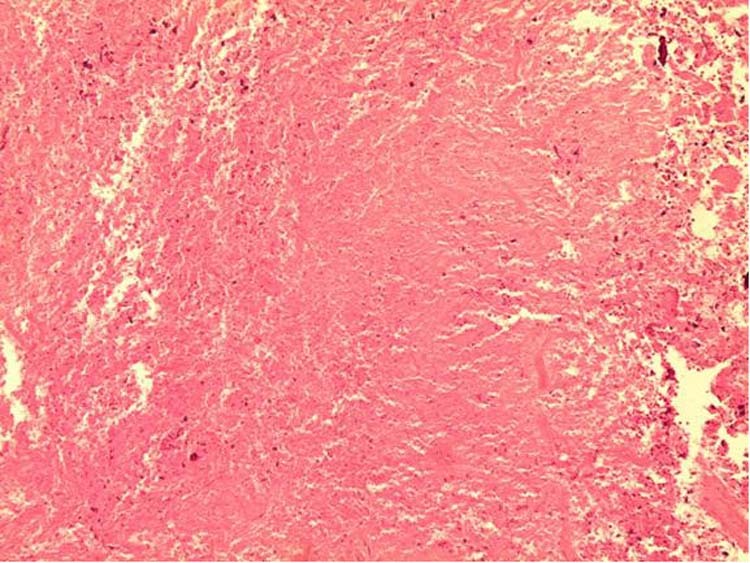 Figure 3 Histopathology showing extensive necrosis of bone and soft tissue with coccidioidal granuloma present within both the talus and the surrounding synovium. Post operatively the patient was immobilized for 6-8 weeks to allow consolidation of the talar fractures. The patient underwent a full body three phase bone scan to evaluate for any other disseminated locations. Bone activity was noted in several ribs and the left navicular and calcaneus The patient was placed on fluconazole 200mg twice daily for life by the infectious disease department. Although complete resection of the infected bone was recommended, the patient was not willing to undergo an extensive debridement of the rearfoot. At nine months follow up, the patient was ambulating comfortably in regular shoes with an ankle foot orthosis and was continuing with anti-fungal therapy. He was subsequently lost to follow up. In this case, the patient’s initial history included disclosure of previous pulmonary coccidioidomycosis. However, he also had a history of diabetes mellitus, osteoarthritis, and gout. All of these comorbidities could be etiologies of the patient’s presenting complaint. Laboratory values indicated no elevation in white blood cell count, but he did have an elevated uric acid. On initial exam, joint aspiration was attempted with no fluid obtained; therefore, no microscopic evaluation of the joint fluid could be performed. After arthroscopy of the ankle, his symptoms resolved. At his 3 month post operative appointment, follow up radiographs revealed extensive destruction of the talus and subtalar joint area not previously noted on radiographs. After bone biopsy and culture was performed, coccidioidomycosis was the definitive diagnosis. Due to the extensive infection throughout the entire talus and portions of the calcaneus and navicular, the patient would have likely undergone a proximal amputation due to the need for debridement and resection of such a large amount of bone. The patient and the podiatry team agreed to attempt suppression of the infection with fluconazole, serial radiographs, and periodic follow up visits. Unfortunately, he left our care nine months later. In conclusion, disseminated coccidioidomycosis is an aggressive and destructive form of osteomyelitis that requires lifelong therapy. Although the infection is rare, coccidioidomycosis should be considered in individuals living in the endemic areas of the southwestern United States. Early recognition and treatment are important to prevent loss of function and extensive surgical debridement of the affected limb. 1. Galgiani, J: Coccidioidomycosis. The Western Journal of Medicine 159 (2): 153 – 181, August 1993. 2. Stevens, D: Coccidioidomycosis. The New England Journal of Medicine 332 (16): 1077-1082, April 1995. 3. Panackal A, Haffeh R, Cetron M, et al: Fungal Infections Among Returning Travelers. Clinical Infectious Disease 35:1088-1095, 2002. 4. Drutz: Coccidioidomycosis Part 1. American Rev Respiratory Diseases 117: 559-585, 1978. 5. Bried J, Galgiani J: Coccidioides immitis Infections in Bones and Joints. Clinical Orthopedics and Related Research 211:235-243, October 1986. 7. Sprinkle R, Kosova L, Tougas T, et al: Disseminated Coccidioidomycosis of an Ankle Joint. Journal of the Podiatric Medical Association 79 (6): 300-305, 1989. Treatment Using Local Debridement and Long Term Ketoconazole Therapy. 9. Sandoval J, Shank J, Morgan S, et al: Midfoot Coccidioidal Osteomyelitis. A Case Report and Review of the Literature. Journal of Bone and Joint Surgery Am. 88: 861-865, 2006. 10. Galgiani J, Ampel N, Catanzaro A, et al: Practice Guidelines for the Treatment of Coccidioidomycosis. Clinical Infectious Disease 30: 658-661, 2000. 11. Kushwaha V, Shaw B, Gerardi J, et al: Musculoskeletal Coccidioidomycosis. A Review of 25 Cases. Clinical Orthopedics and Related Research 332: 190-199, November 1996. 1 Chief of Podiatry, Carl T. Hayden VA Medical Center, 650 E. Indian School Rd. , Phoenix, AZ 85012. 2 Attending Podiatrist, Carl T. Hayden VA Medical Center. 3 Private Practice, Atlanta, GA. Former 3rd year resident Carl T. Hayden VA Medical Center. 4 Attending Podiatrist, Carl T. Hayden VA Medical Center.